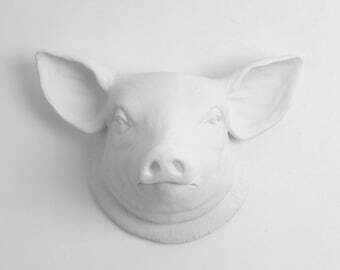 Announcement White Faux Taxidermy ® animal wall decor made with l♥ve. 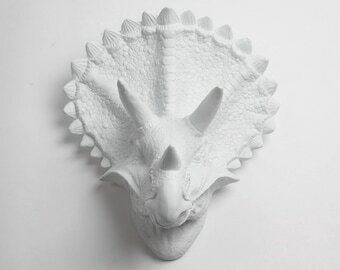 Deer, Moose to Dinosaur decor, animal skulls, & More. 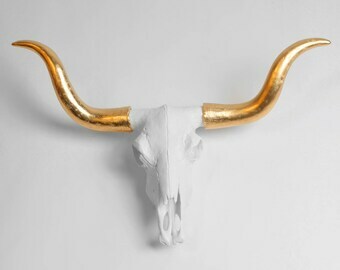 Find white deer head wall mounts, balloon dogs, unicorn, elephant, giraffe, bison skulls, antler decor, bears, lions, resin rustic western decor & many more animal head wall sculptures. *Offers subject to end at any time. 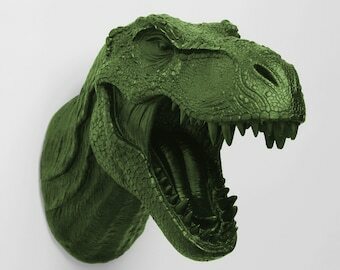 Offer valid Only at Etsy.com/shop/WhiteFauxTaxidermy. Need a specific color? Send us a message! Our current production lead time is 1-3 business days on most orders. Holiday delivery? Please see our FAQ for more information. 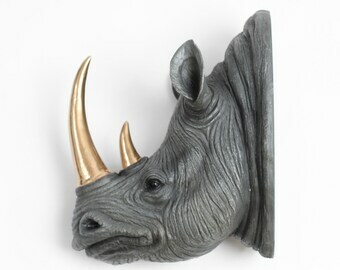 Have you always wanted to mount a wild animal head on your wall for a decorative effect? 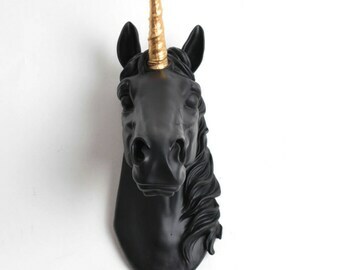 Of course you have, it makes for great ambiance and speaks volumes about your aesthetic taste and courage. 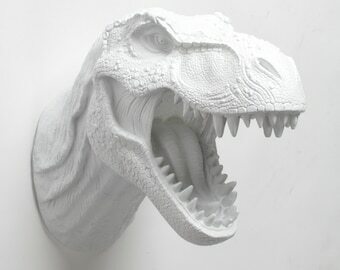 Allow us to create your perfect resin animal bust sculpture. 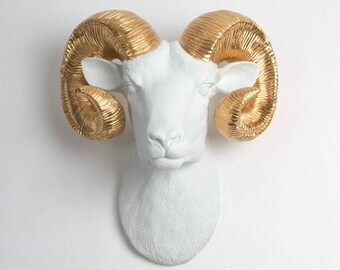 © 2012-2019, White Faux Taxidermy® is a registered trademark of Aberly, LLC. All Rights Reserved. 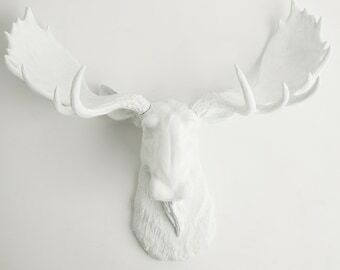 White Faux Taxidermy ® animal wall decor made with l♥ve. 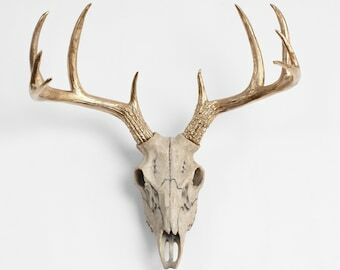 Deer, Moose to Dinosaur decor, animal skulls, & More. 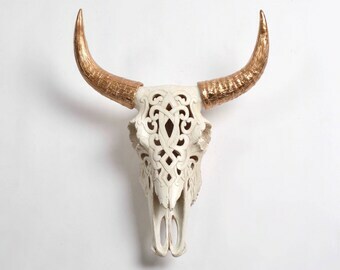 Find white deer head wall mounts, balloon dogs, unicorn, elephant, giraffe, bison skulls, antler decor, bears, lions, resin rustic western decor & many more animal head wall sculptures. 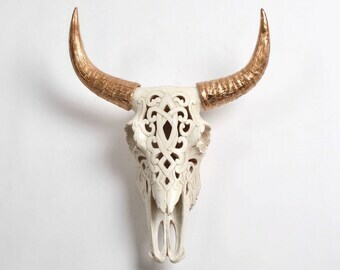 Natural Filigree Bison Skull w/Gold Horns - White Faux Taxidermy - Resin Buffalo / Bison Skull Head- White Faux Taxidermy Cow Skull :. 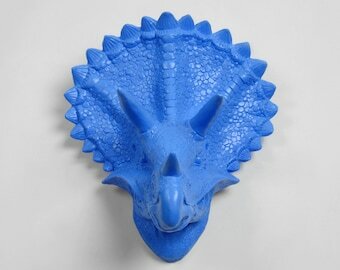 This product was shipped very well and is so cool. 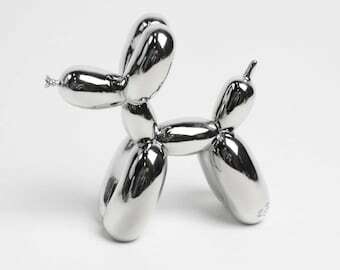 I ordered this and the medium metallic silver balloon dog and absolutely love them! Very well made and the perfect addition to my home. Good morning WFT fans! Don't forget, Valentine's Day is this Sunday. Our animals make a great gift for friends, family or a special someone, including yourself. Find our most loved animals on sale now. Don't forget to use WFTLOVE16 to save an extra 10%. 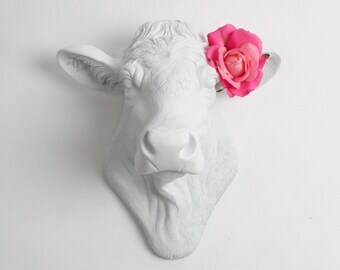 White Faux Taxidermy Cyber Monday SALE! Save 35% on your entire order using: GOBBLEGOBBLE15 at checkout. Don't forget, today is the last day! Lets start at the beginning. The story begins with Marcos, born in Mexico circa 1985 and connects a few of years later to Paislea, born in Colorado circa 1990. Seemingly worlds apart, yet… fast forward to 2009, when Marcos meets Paislea at work. Some flirtation occurs and before you know it they discover their joint love for animals and nature. Continue fast forwarding and you find them dating, talking about kids, life, several moves, marriage and a growing animal collection. They begin their animal collection with their two cats "Templeton" and "Edmonton", a salt-water tank filled with odd creatures, Wynn the mixed schnauzer, and temporarily fostering dozens of orphan cat families. Being at a capacity for real animals, they decided to continue their love for animals by incorporating faux animal decor into their home. Paislea being the artistic one, and Marcos being the entrepreneur, they decided to customize their very own faux animal taxidermy to fit their home decor. Their love for bright colors, unique styles, and creativity gave birth to White Faux Taxidermy & Home Decor. They knew their creations would be a hit so with marketing careers well underway they decide to turn a weekend project into a full time business. 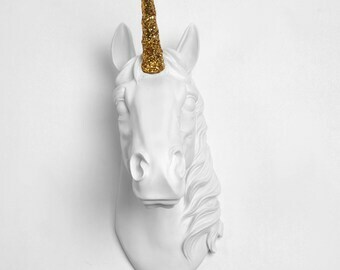 From the crowded streets of SoHo to the busy nightlife of Tokyo, White Faux Taxidermy products have adorned the walls of thousands upon thousands of clients, businesses, hotels, and so much more. Sought after by well known interior designers from six of the seven continents, WFT has created a highly talked about and creative culture for not only the fashionable, but also the animal lover in every one of us. To keep up with production the team at WFT grew quickly and now consists of Paislea, Marcos, Ricardo, & Ashley. Winston brings us smiles and inspiration throughout the day with his wiggly tail and energetic personality! Templeton & Edmonton were our original inspiration for our shop and we have continued to learn and grow with these little guys right by our side! "By day I'm a biologist, husband, & house-guest to 2 cats, but by night I'm tired." "I'm Ashley- Please give a stray pet a forever-home, and save a moose. I love animals and going to school." 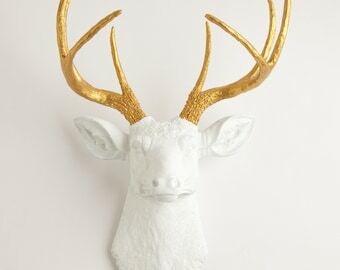 Welcome to White Faux Taxidermy® on Etsy. Everything you see in our shop is handmade to order from start to finish by a member of our team in Orem, Utah. 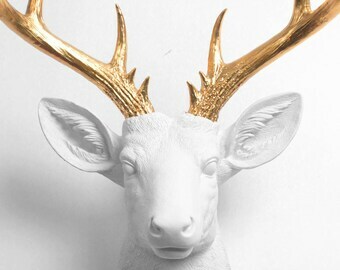 Our love for animals, chic and trendy design, and all things white gave birth to "White Faux Taxidermy." White Faux Taxidermy is inspired by resin cast animals, however, we work with a variety of materials. Feel free to contact us if you have any questions about our products. Please note that all our pieces are made-to-order, therefore all sales are final. Rest assured, each sculpture is shipped fully insured; in the event it is damaged in transit WFT will submit a claim. Please retain all packaging to expedite any claim. 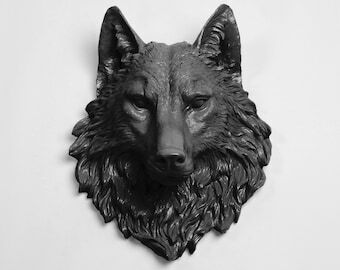 -Canada orders: Please note that though your sculpture will ship UPS, delays at customs, including required import fees paid by the purchaser, will have to be settled prior to successful delivery. Please note that your shipping fee does not include VAT Tax & Import Fees, which vary from province to province. -United Kingdom: As of July 2015, current United Kingdom (UK) Customs Taxes for orders under £135 are not assessed an import fee, and any orders exceeding £135-£650 are assessed 2.5% fee in addition to VAT. Note that this does not include VAT, which is assessed for orders over £36. Please note that all orders are subject to VAT, and based on the import documentation and local governing bodies, you will be assessed a tax. This information is solely informative and no guarantees are made. Check with your local tax officials for further details. 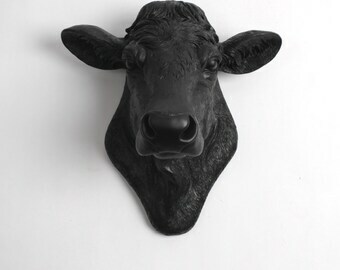 -We ship Faux Taxidermy to Australia: As of July 2015, current Australia (AUS) Customs and Duties fees do not apply to orders under or equal to $1,000 AUD. This information is strictly informative and no guarantees are made. Please check with your local tax officials for further details. -All Other Countries: Import taxes, fees, including inspection fees by customs are not factored into your international shipping rate. The shipping rate paid is solely for the postal service; all additional fees must be paid by the receiver. Fees vary from country to country; we kindly ask that you check with your local government officials for full details. -If local government ordinances require a grace period, WFT will work diligently to ensure you have an exceptional experience and compensate where req. (excluding shipping). -Promotions requiring a 'promo code' must be entered at the time of purchase. No credit will be issued for previously placed orders prior to promotion, or orders placed without code. -Certain 'Sale' item(s) are discounted and do not require a promotional code. Promos found on our website may not apply to Etsy and vice versa. -Promotions and/or Discounts cannot be combined and do not apply to shipping. -Not valid on bulk/custom orders. -Discount applies to actual product only and does not apply to shipping, or customizations. -No rainchecks or exchanges offered. In the unlikely event that you receive a damaged item, a new like-item will be sent. If a refund is requested, only the purchase price will be reimbursed; not the retail price. All items are first-come first-served and limited quantities of certain items may only be available without credit, similar item price-match, or rainchecks offered. -Promotions subject to change at any time. Cancellations are accepted within 1 hour of placing your order and prior to shipping: Cancellations will only be accepted and approved if requested within 1 hour commencing the time you place your order and before your order has shipped (a 100% refund will be issued). 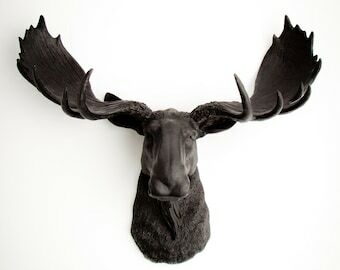 If you have questions regarding a cancellation please contact us via email at info [!at] whitefauxtaxidermy.com or here: http://etsy.me/Y27z4s. Cancellations outside 1-hour window or after shipping: Cancellations outside 1-hour or after shipping may be canceled at the discretion of White Faux Taxidermy. If your cancellation is authorized, you may be required to pay for return shipping and forfeit all original shipping costs. If the item(s) are damaged due to customer negligence, you may be issued a partial or no refund. 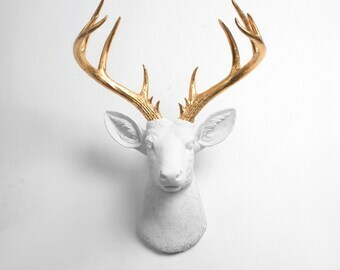 White Faux Taxidermy highly urges all authorized returns to purchase insurance for the cost of the item prior to returning. If you have been provided a label by White Faux Taxidermy, you may disregard purchasing insurance. 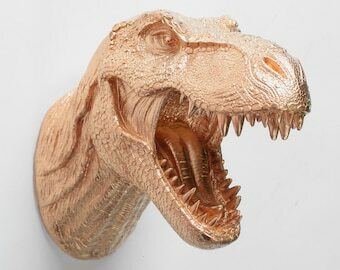 Authorized returns are subject to a 20% restocking fee on all sculptures. If you have any questions pertaining to a pending cancellation, restocking fees, or change in order. Refund Method: If your cancellation is processed, please allow 5-to-7 business days to process your refund. All refunds will be credited to the original payment method. General item(s): All items are 100% bespoke and custom made to order. Because of this, all sales are final. Incorrect item(s): If the item(s) you have received do not match the item(s) you have ordered, please contact us within 48 hours from the date of delivery. Once receiving notification that your product is incorrect, we will replace the item upon approval and/or issue a refund. Products that appear to be used are non refundable/returnable, no exceptions. 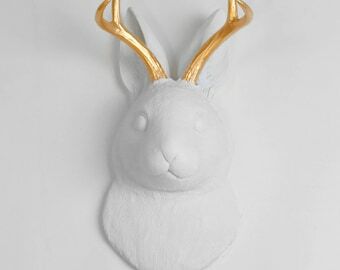 If you have encountered an error, please contact us here http://etsy.me/Y27z4s or at: info [!at] whitefauxtaxidermy.com. 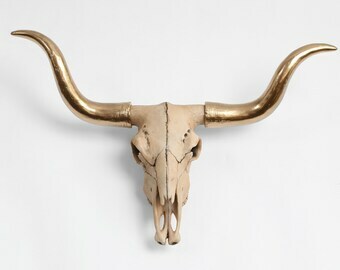 -If your return request has been authorized for an incorrect product, White Faux Taxidermy will provide an address to which the return may be shipped. 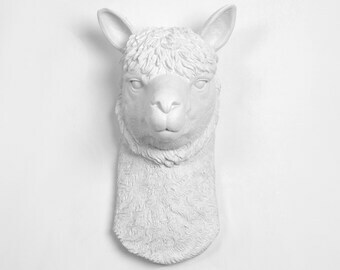 Return shipping fees are not covered by White Faux Taxidermy and are at the cost of the buyer. International orders are handled via USPS® / United States Postal Service, and vary case-by-case. Please contact us if you are experiencing issues outside of the United States and Canada. 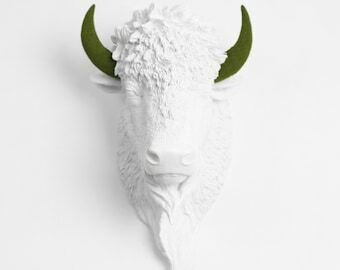 *A fee may apply / not covered by White Faux Taxidermy. Damaged item(s): In the rare and unfortunate event that your item(s) is/are damaged, please contact us immediately (email info [!at] whitefauxtaxidermy.com). 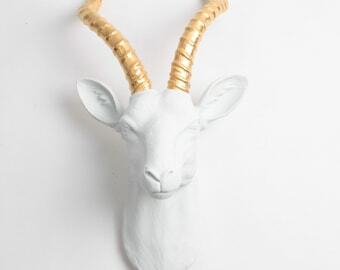 White Faux Taxidermy insures all items shipped. For convenience, White Faux Taxidermy will handle all UPS® and USPS® claims (unless otherwise requested by UPS® or USPS®). If your item(s) have damage caused by White Faux Taxidermy, we will gladly work diligently to rectify the error. In order to facilitate your request, you may be asked to return the item(s) and/or provide image(s) of the damage. International / EU Orders: If local government ordinances require a grace period, WFT will work diligently to ensure you have an exceptional experience and compensate where req. (excluding shipping), however, orders are generally non-refundable. Please note that all orders are made-to-order. NOTE: PLEASE RETAIN ONTO ALL PACKAGING, INCLUDING BOX(ES), DAMAGED SCULPTURE(S), AND ENCLOSED RECEIPT(S). White Faux Taxidermy may request photographs to expedite a claim, or the physical item(s) to be inspected by the carrier (if requested). If it is deemed that the item(s) acquired damage from the customer, your claim may be denied and no refund issued. Your credit card will reflect our company name of Aberly LLC. We accept PayPal, Visa, American Express, Discover, & Mastercard. • Your items will be created and shipped only after your payment has cleared. → All of the information regarding your package and order status can be found in the invoice area here on Etsy: https://www.etsy.com/your/purchases. • You will receive a notification from Etsy when your order has been shipped to the email address you entered on your order. Most order ship within 1-3 business days of purchase. Shipping times may vary due to the payment method and/or quantity of items purchased. Orders are not shipped on weekends or holidays. Each product is custom and manufactured directly after it is purchased. As a result of this, our items can take 1-3 business days to ship. Average Shipping time is: 2-5 business days on most orders (Updated January 1st, 2018). Estimated shipping times are not guaranteed, but it is most likely that the item will ship within the time frame listed. Bulk & custom orders may experience a longer delay. Shipping is calculated via internal processes to ensure we bring you the lowest cost possible per each provider, such as UPS for US & Canada or USPS Priority for international orders. 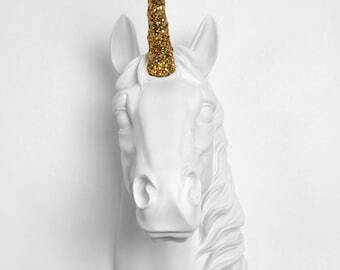 White Faux Taxidermy ships Worldwide (including Alaska, Hawaii, APO/FPO, P.O Boxes for an additional charge). For international orders, excluding Canada (ships UPS to most provinces), WFT utilizes USPS International. WANT TO SHIP OUTSIDE OF THE UNITED STATES? • All packages are sent via UPS Ground for orders sent within the continenal US & Canada. • International packages are sent via USPS Priority International. • Tracking number, delivery confirmation and insurance are always included. • Signature is required upon delivery. White Faux Taxidermy® ships virtually throughout the world: Canada, Mexico, Brazil, Argentina, Chile, and virtually all of South America. In Europe, we ship to Spain, Portugal, France, Great Britian (England, Scotland, Ireland, etc. ), Germany, Netherlands, Belgium, Denmark, Norway, Finland, Iceland, Greenland, Poland, Lithuania, Latvia, Estonia, Belarus, Ukraine, Moldova, Romania, Greece, Bulgaria, Serbia, Hungary, Austria, Czech Republic, Slovakia, Italy, Turkey, and all others not listed. Our products have also shipped to Georgia, Saudi Arabia, Israel, Jordan, Egypt, Sudan, Morocco, South Africa, etc. In Asia, we ship to: China, Japan, Taiwan, South Korea, Bangladesh, India, Thailand, Malaysia, Philippines, Sri Lanka, Indonesia. And, to our friends in Australia and New Zealand. To get your shipping rate, simply go through the checkout process. You will automatically be provided with the exact shipping rate. White Faux Taxidermy cannot control and is not responsible for any duties/taxes applied to your package. You will be responsible for paying additional charges for customs clearance. Customs policies vary widely from country to country; please contact your local customs office for further information. Note, in rare occasions custom agents may delay delivery of some packages. Import duties, taxes, VAT charges are not included in the item price or shipping charges. If you refuse a shipment from White Faux Taxidermy, you are responsible for the original shipping charges, any import fees, duties and/or taxes that are incurred on the package, and the cost of returning the package to White Faux Taxidermy. This amount will be deducted from any refund if applicable. In the instance that the return fee exceeds the amount of the merchandise plus shipping costs, the package will be abandoned and you will not be refunded. Canada Customs requires Canadian recipients to pay applicable duties and taxes on each shipment entering Canada. These charges may include PST, GST, HST, duties and other taxes of goods (e.g. excise tax). A brokerage fee is also charged to process shipments and present the requisite customs paperwork to Canada Customs on the importer’s behalf. Your order will be shipped under UPS’s e-Tailer Brokerage Program (eBP), where eligible shipments imported into Canada for non-commercial purposes and valued under CAD$ 200 shipped via UPS Standard service are subject to a reduced brokerage fee of CAD$ 10, plus any applicable duties and taxes. Shipments valued at CAD$200 and above and/or being imported to Canada for commercial purposes and/or subject to specialized clearance may incur additional fees. Please, be aware that UPS will request payment of these charges at the time of delivery. You have the ability to call UPS ahead of time (1-800-742-5877) to pay these charges, eliminating the need for payment on delivery. Effective Date: March 18th, 2013. We send each order to the address used upon checkout. Please make sure that this address is up to date and correct before submitting your order. We are unable to ship to an alternate address if not verified and confirmed through PayPal or your Etsy account. We do not ship to PO boxes. If a PO box is preferred, an additional charge will be required. WHAT'S YOUR 2018/'19 SHIPPING SCHEDULE & PACKAGING? *Please ensure you have entered the correct shipping information to a valid street address. 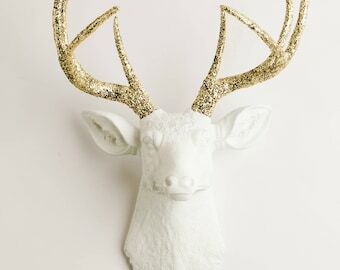 White Faux Taxidermy works diligently to ensure a timely holiday delivery. However, due to uncontrollable factors, including winter weather delays; we cannot 100% guarantee delivery prior to Christmas. In the event there is a delay, you may receive notification from UPS (Domestic only). 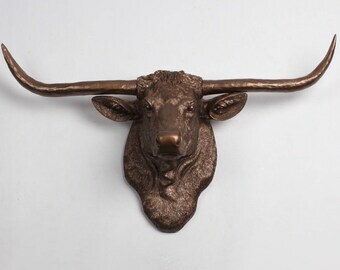 White Faux Taxidermy® utilizes the best estimates provided by UPS to provide shipping delivery dates. Please note all orders ship in a branded White Faux Taxidermy box. IS EACH PRODUCT HAND PAINTED? Yes, each of our products are hand painted, therefore, each product you receive will be unique. The colors presented are representational only and should not be used to judge actual sculpture color 100%. • We encourage you to handle your WFT pieces with care, as damaged product caused by improper handling by the recipient is also not our responsibility. •Promotions requiring a 'promo code' must be entered at the time of purchase. No credit will be issued for previously placed orders prior to promotion, or orders placed without code. •Discount applies to actual product only and does not apply to shipping, or customizations. •No rainchecks or exchanges offered. In the unlikely event that you receive a damaged item, a new like-item will be sent. If a refund is requested, only the purchase price will be reimbursed; not the retail price. What is the size in metric (centimeters)? Great question! The sculpture measurement are given in inches. Simply multiply the inches by 2.54. 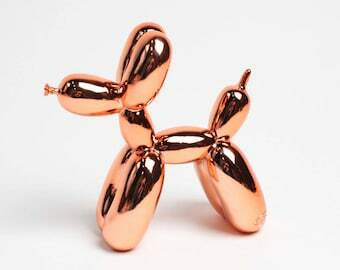 For example, if the sculpture measures 15": 15 "x 2.54= 38.1 cm.